In the last few years, it’s the main trend to connect cars. Internet access in the car or camping Mobile is still reserved for the premium class. However, new wireless gadgets provide solution. The Huawei E8377 specially designed for the motor vehicle provides the first use and inexpensive hotspot router with LTE. We have tested the “Huawei Carfì Router” for you and share the details below. With the Carfì E8377 router, user can access internet via the mobile Wi-Fi hotspot. The CarFi could work on 3G or 4G LTE and up to 150 Mbits per second download speed are possible here. The concept is not entirely new. 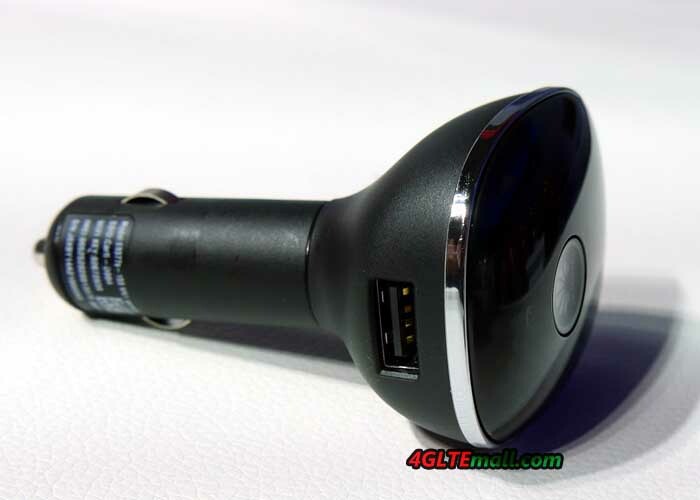 Huawei had brought a car Stick named W5101 for the first time to the market. It’s available for Vodafone contract. But it’s an ordinary USB stick, which was connected via an adapter into the cigarette lighter. The E8377 Carfì could connect to the card through the cigarette power connector, which is a direct solution for wireless network. The packaging looks quite classy and looks like a clock-bell. After opening the box, there is only a mini-manual next to the device. In addition, a tiny leaflet-list is available for installation. The user manual (sweet 6.5 x 5 cm) available in several languages and there are short Tips for settings. The egg-shaped head of CarFi E8377 gives only a start switch, a notification LED and laterally a SIM card slot (Micro SIM) together with the reset button. Directly to the head connects to the cigarette 12-volt port. From a processing perspective, the device is “appropriate”. The specially adapted to use in the car shape design, the E8377 hardly looks like a foreign body in any case. Now, let’s consider technical data. The mobile module initially supports LTE in all major bands at 800, 900, 1800, 2100 and 2600 MHz. Thus, the Car-stick can easily use in Europe. Based on the LTE Cat4 modem, it can reach up to 150 Mbps for download and up to 50 MBit for upload in connection with a matching LTE tariff. In addition to LTE/4G, the CarFi still has support for more mobile phone standards. Among them are as UMTS 900 and 2100 MHz 3G Turbo DC-HSPA+ (up to 42 Mbps) and 2G (GSM, EDGE, GPRS). So even in very poor regions with weak signal, user can still have the chance of a slow connection. The WLAN module supports 802.11 b/g/n and thus can provides data rates up to 300 Mbps. The router Carfì measures 5.9 x 4.9 x 8.8 inches and weighs only 50 grams according to the manufacturer. However, our weight measurement yielded 146 grams. 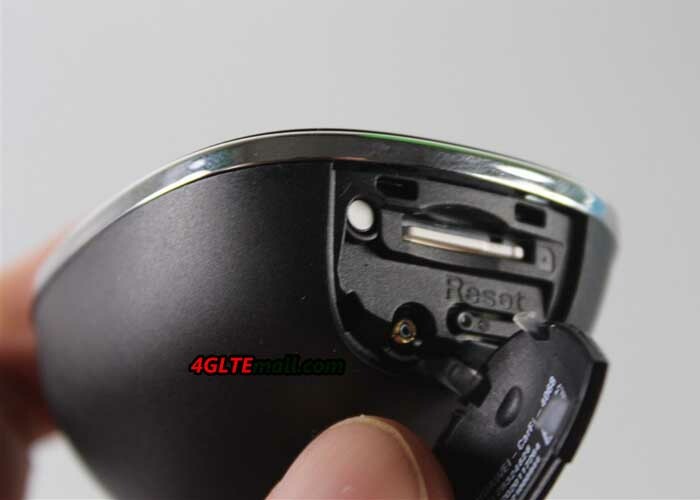 Huawei will also indicate that the E8377 has an integrated battery, which has a capacity of 1900 mAh. However, we were able to connect Carstick for long hours of use on the current port, without connecting the CarFi to the cigarette slots. Thus, we believe that the battery only serves to maintain the operation as soon as the energy source is gone suddenly. A USB port is located on the side. This port is not a data interface, but as a kind of adapter. 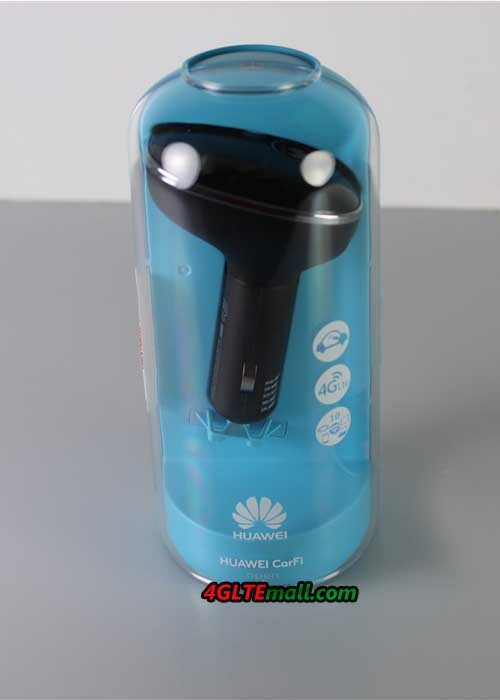 Huawei has considered that many people use the car’s cigarette lighter as a charging station for mobile phones and other devices, when the cigarette port is used. No more space will be available without adapter for third-party devices. Through the USB port on the side, you can now connect there and load it. Beside the SIM slot, there is a TS9 connector for connecting an external antenna. However, only 1 port, users have to give up 2×2 MIMO. But at least there is a possibility! It is precisely when traveling, for example with a camper, the reception is weak and need external antenna. * White: Indicates unread SMS exist. Theoretically, the installation of the E8377 is easy and should be done in less than 3 minutes. First, the SIM card must be inserted. The slot is located under a cover with SIM icon. Then plug the Carfì directly into the cigarette lighter of your car. Turn the ignition so that a power supply is present and press the “Huawei” button on the top for a good 3 seconds. Now the border should first turn red – the CarFi router will start and automatically connects to the wireless network. This takes about 20 seconds. Now you can search the wireless SSID of CarFi E8377 in a laptop, tablet or smartphone. This begins with “Huawei CarFi-“. Both SSID and the wifi key are listed at the foot of the plug. Enter this key or scan the QR code on request with your smartphone. The WLAN connection to Carstick should now be finished. If there is a cellular connection via 2G / 3G or 4G, surfing internet is possible in the way. And up to 10 devices in and around the car could access to the internet. Huawei provides a special HiLink App for smartphone and tablet users. This can (if no network) are downloaded directly to the internal memory as required from the PlayStore or AppStore. The app provides information about the connection status, for example, the signal strength, currently used wireless standard and data usage. We have tested the car stick several hours on the road. The installation went really smoothly. Before setup, user must know the color code, otherwise you do not initially know what that mean the color feedback. In mobile reception there is nothing to complain about. This is comparable with other sticks. You should wonder the connection speed in remote areas. Frankly speaking, the speed is just decent, but this problem can be solved by an antenna that is mounted with enough cable on the roof through the window. 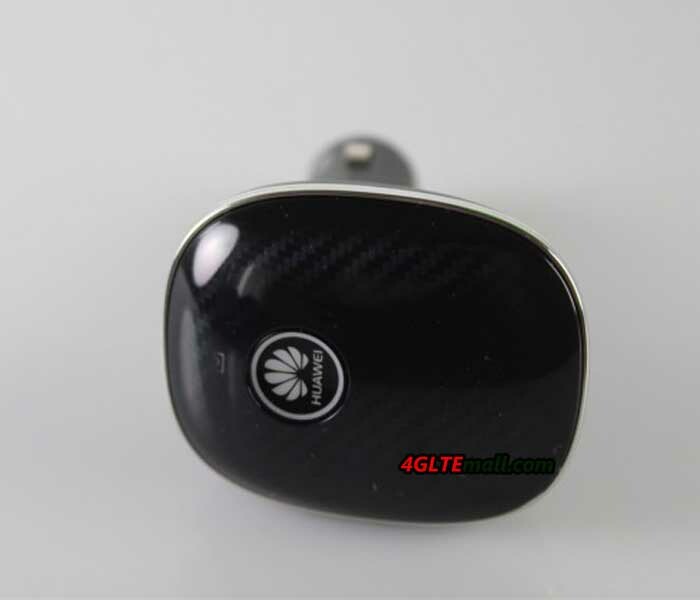 Huawei E8377 Carfì is ideal for those who spend hours on the car and where several inmates want to access the Internet. The installation and handling is simple and straightforward. However, there is currently no better alternative for the car. 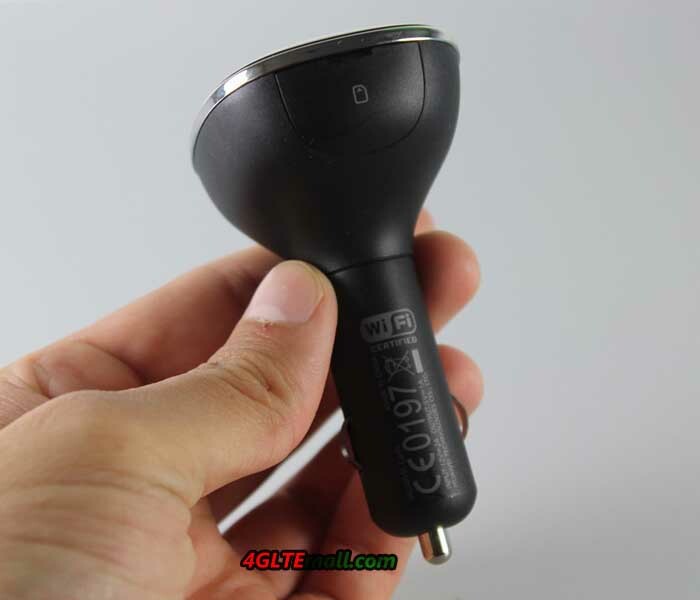 If you want to have wireless network around in camp or have activities in a car, Huawei E8377 would be a perfect partner.